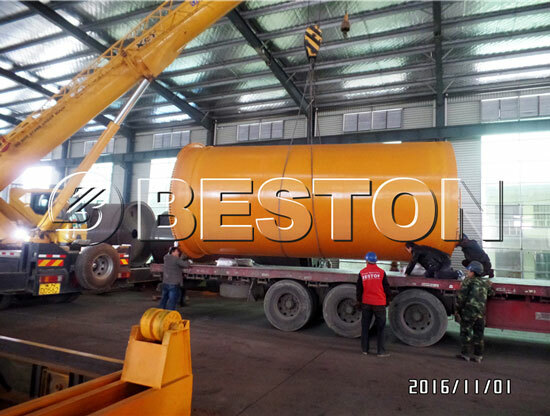 Beston BLJ-6 and BLJ-10 are both small plastic recycling plant which belongs to the batch-type operating plastic pyrolysis plant. And the daily capacity of this machine is 6 MT to 10 MT. 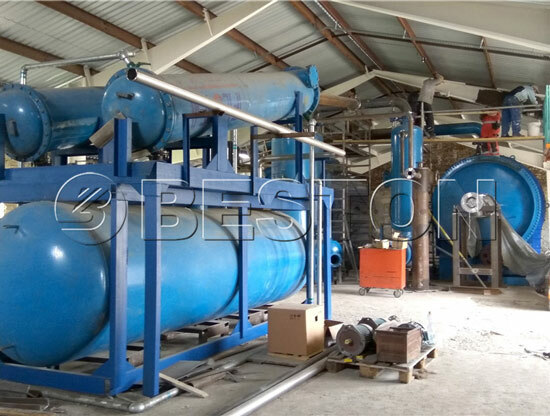 This small scale plastic recycling plant, you can also call it mini pyrolysis machine, doesn’t need pre-treatment equipment to treat the plastic waste before the pyrolysis process because the waste plastic can be fed into the pyrolysis reactor directly. Now let’s take a look at this small scale plastic recycling equipment. 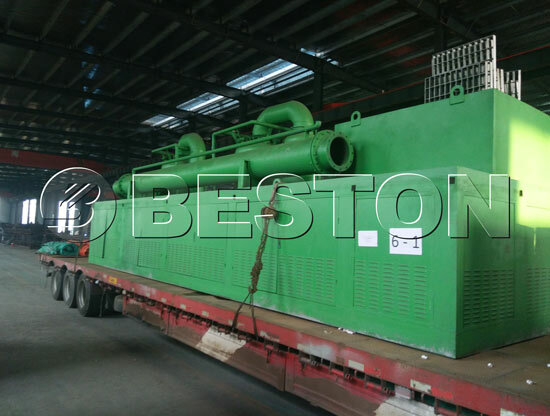 The latest small-scale plastic recycling machine of Beston mainly includes the following parts, pyrolysis reactor, casing, manifold, heavy oil tank, oil condenser, oil tank, hydro seal, auto carbon black discharger, burning room, air blow, gas gun, flue condenser, dedusting system(water spray, ceramic ring filter, washing chamber), water tank, cooling tower and safety devices (alarm for over temperature and pressure, auto pressure releasing system, firefighting devices). Owing to the small size, handy operation, and complete functions, this kind of machine becomes more popular at the international market for recycling machines. 1. 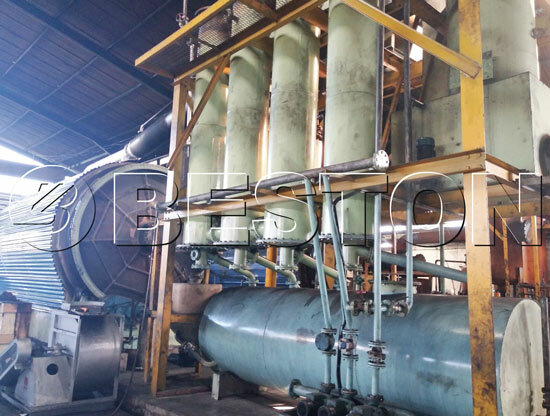 Feed the waste plastics into the pyrolysis reactor by manual operation. 2. Heat the reactor by using fuel materials, such as coal, charcoal, fuel gas, wood, etc. The reactor will be slowly heated and when the interior temperature of the reactor reaches around 160 ℃, the oil gas will be produced. 3. A part of oil gas will go to the condensing system to form liquid oil. The gas which cannot be liquefied under normal pressure will go back to the combustion system. It can be used as fuel material to heat the reactor, which will save energy for the whole working process. 5. After finishing oil production, the temperature of the reactor will be down. 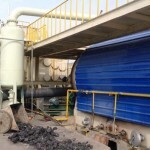 At the same time, carbon black will be discharged automatically. 6. Lastly, the smoke produced from the reactor can achieve national emission standard after being processed by the dedusting system. • Reprocessed into diesel and by waste oil refining plant. 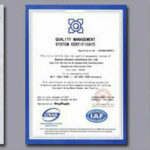 • can be used as fuel for steel factory, power plant, cement factory, restaurant, etc. The main components of the exhaust gas are alkanes class from C1 to C4, which cannot be burned directly because of the high danger. Therefore, under the unique security design of Beston, the gas will first go to the hydra seal to get the dangerous components cleansed and removed before burning up them as fuel. The hydro seal can stop the fire burning back while removing sulfur and impurities of the gas. Professional thermometer and pressure gauge to inspect temperature and pressure at any time. The third generation of the heating method which combines the advantages of direct and indirect heating. It is also safe for the operation. In the daily operation, the exhaust gas room is closed. When the pressure is too large, you can open the exhaust gas room to quickly reduce the temperature and air pressure of the reactor. Prevent outlet valve clogging technique. With the automatic submerged arc welding technique, both the working efficiency and the quality of the plants are improved. Ultrasonic flaw detector can detect every flaw of the plant. Specific operating tech to deal with all the bugs during the production. Our small scale plastic recycling machine has got the CE ISO SGS certification and the quality of it is ensured. 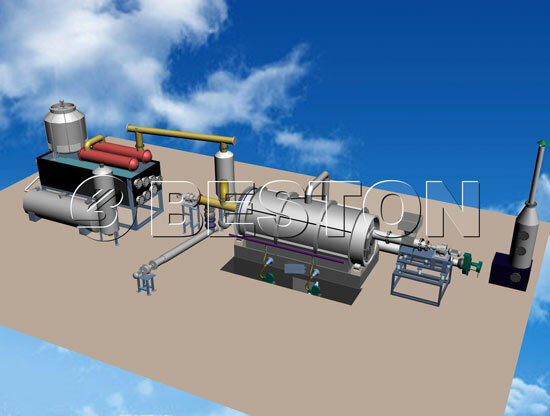 Aside from the high safety design and high quality, the small scale plastic recycling plants have their own characteristics compared with the continuous pyrolysis plant. Due to the small size and small capacity, the customer will save a lot of costs on space, electricity, manpower, and fuels. Moreover, the small plastic recycling machine price will also be lower than the larger one. So investing in a small plastic recycling machine doesn’t only save a lot of money, but also help you get a faster return from your investment. At present, this plant has been exported to many countries, such as Hungary, Dominica, Nigeria, South Africa, Jordan, South Korea, Indonesia, Brazil, Australia, Nigeria, etc. 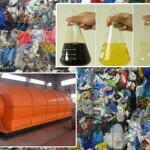 If you just have some small number of plastic waste to dispose of, you can consider investing in a small plastic recycling plant. 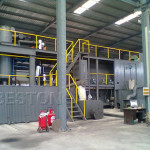 Beston Group will give you a reasonable price and a detailed small scale plastic recycling plant project report to help with your investment. Please do not hesitate to contact us.